Once upon a time a risotto. This is how it starts the story that I am going to tell you today. A story in which the rice becomes a sort of Prince Charming and the delicate damsels are the flavors that will lead us to Mediterranean lands in ancient times of the Italian ” risotto “. Someone said “Risotto was born in Naples”. This is not quite true I think it is related to the fact that the rice was brought to Italy in the South of the country by the spanish people and it was introduced as food firts in Naples. But rice did not stop in the southern Italy, but it made its way through the North of the country where it found and important role in the Italian cuisine. At first, the term “risotto” was not referring to a dish, but rather to a way of cooking rice called in Italian “cottura a risotto”. From the second half of the 1500s there are some written records about the existence of a typical Milanese dish . For example in 1570 , Bartolomeo Scappi , personal chef to Pope Pius V, published the book “Opera dell’arte del Cucinare” that contributed to its fame, and he mentioned ” Vivanda di riso alla Lombarda ” (a dish of rice prepared in a Lombard style) prepared from boiled rice , enriched with cheese, sugar , cinnamon, ” cervellata ” (a type of Milanese sausage flavored with saffron, an essential ingredient to prepare the “risotto alla milanese” in the following centuries) and chicken . Then there is another story somewhere on the border between real and anecdotal, that about the Belgian glazier,Valerio di Fiandra, daughter’s wedding who, in 1957, took part in the work on the construction of the imposing Duomo in Milan. The story says that to the wedding, among other delicacies , one of the disciples, called ” Zafferano “, convinced the chef to serve a pyramid of golden rice , colored in a symbolic way with saffron (to ridicule his weakness to use saffron in paint used to color the window glass ) – diners, not knowing it was a joke, tasted it and the saffron rice proved to be very popular . In 1773 Vincenzo Corrado, in ” Cuoco Galante ” submitted a new recipe for yellow rice, boiled in stock with egg and cheese and in 1779, Antonio Nebbia , in ” Il Cuoco maceratese ” was the first to suggest “pan -toasting the rice after being left in the water for several hours .” Later, in 1839 , Francesco Cherubini said that rice should be ” flooded ” with good stock . Things did not stop there and in 1853 , the famous chef who published the ” Nuovo Cuoco Milanese ” mentioned the first recipe called ” yellow rice alla milanese ” which included butter, saffron, beef marrow and grated parmesan . 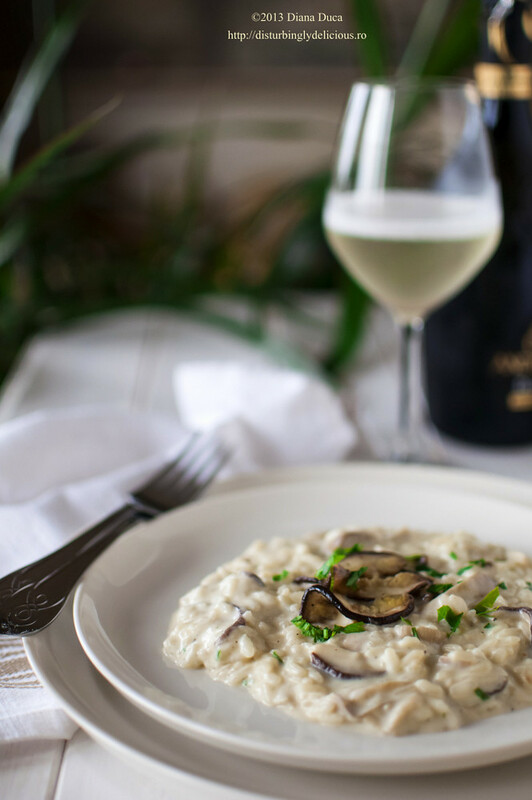 Later, in 1800, Artusi included in “La Scienza in Cucina e l’Arte del mangiar bene ” two variants of risotto alla milanese, one promoting the wine and the other wine and beef marrow . Then there was the modern interpretation of the famous risotto alla milanese by Gualtiero Marchesi ” oro e Zafferano ” (gold and saffron ) which added a few gold foils to his risotto made with Carnaroli rice. In 2007, the City of Milan recognized the name “De.Co. ” risotto alla milanese” as a traditional product together with ” panettone “, ” Michetti ” (a type of bread ) ” cassoeula ” and ” ossobuco ” . 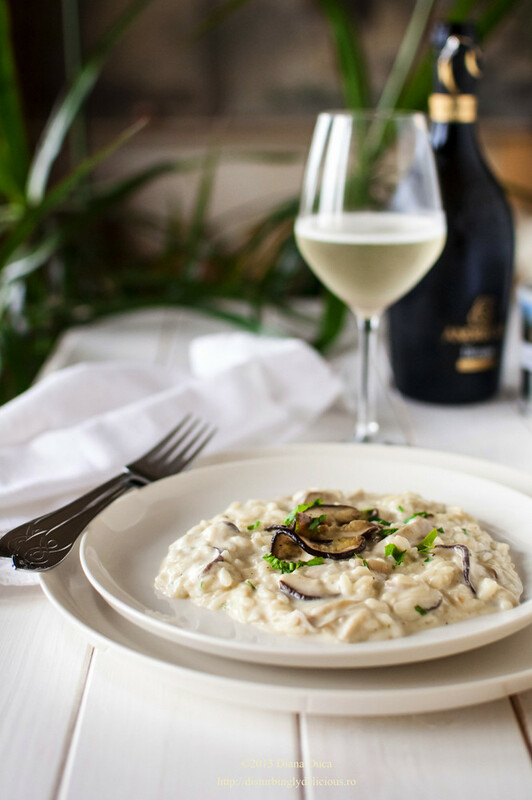 As I said in another article, the best rice for preparing a risotto is Carnaroli, although tradition says that the Arborio , Padano and Vialone Nano are also good. I prefer Carnaroli . 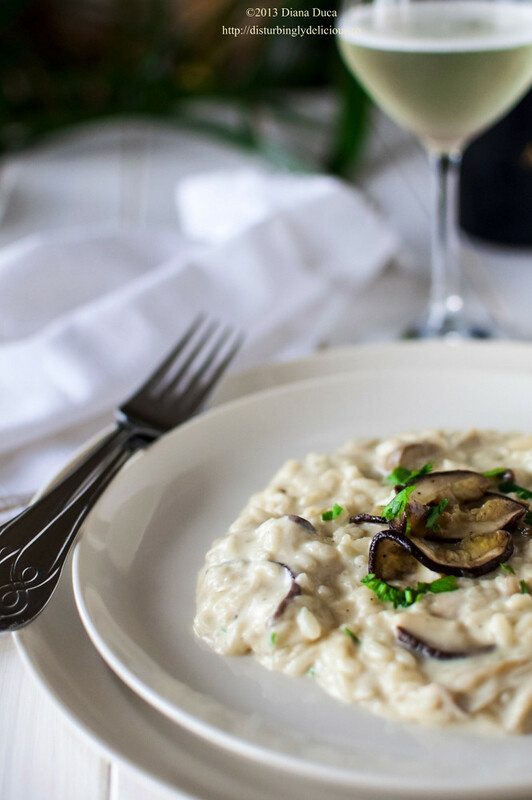 In compliance with the basics that include Anna Gosetti on the preparation and the consistency nowadays there are many variations of risotto and what will talk about next is a “risotto ai porcini” ( risotto with procini mushrooms ), one of my favorites ever. 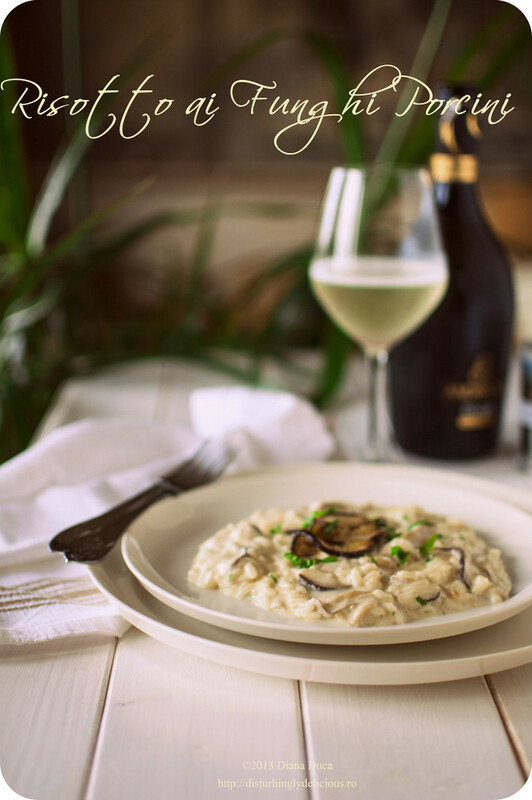 You can read more about the preparation of a good risotto in an intreresting article written by Andra @ Mint and Rosemary , together with a lovely recipe. Clean , wash and slice the mushrooms; crush the unpeeled garlic clove; sauté the mushrooms in hot olive oil with the garlic (that would be removed afterwards) for almost 10′. Set aside. Heat half of the butter in a pan, add the shallot and cook until it gets soft; add the rice and toast it for 2′ until it becomes opaque. Add the wine and continue cooking until alchohol evaporates. Add a pinch of salt, add the stock gradually ( a ladleful at a time) and stir gently until it evaporates before adding more stock. When the rice is ready ( “al dente”) remove from the heat, add the butterm the robiola cheese and some grated parmesan cheese and stir well until the risotto gets a creamy consistency. 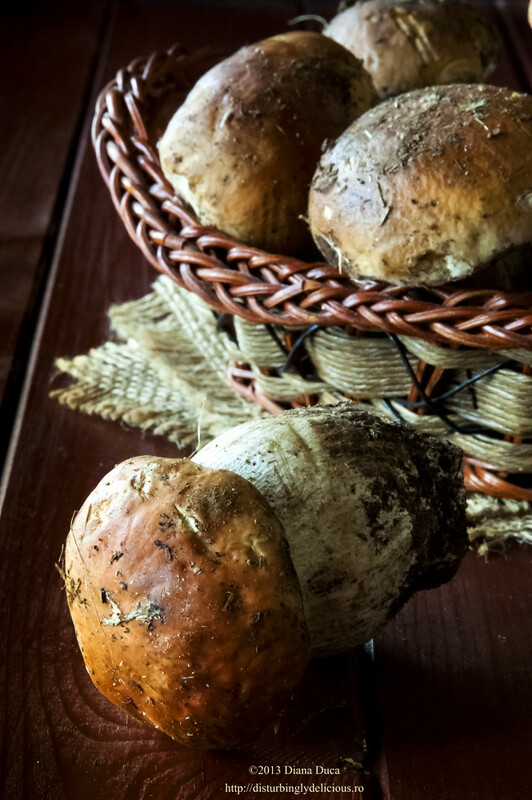 Serve it decorated with few mushroom slices , some parsley and fresh gorund pepper. My dear, ce delicatesa! Oh, si ce poveste minunata! Marele meu regret in acest an este ca nu am reusit sa mai pun mana pe niste funghi porcini si pentru un risotto, dar ma “hranesc” cu fotografiile tale minunate! Oh, I absolutely love risotto! This looks fantastic — and the first shot of the mushrooms is unbelievable. Love this. What a lovely surprise to see you here. Thank you . I’m a big fan of risotto too. these days. I honeestly appreciate people like you! Takee care! !